This product is a kind of smart human body induction voice prompting device, with direction recognition, external device control, external input control function. It can be used in the exhibition hall, corridor, public places, supermarket, shop and other welcome or prompt occasions. Adopt passive infrared sensing technology. Support 8~320Kbps MP3 audio format, good sound quality. USB port, support USB flash drive, copy new audio files to speaker via USB drive. Built in memory: standard 32Mbit(4MByte) FLASH. Direction recognition function, can switch mode between no direction recognition and direction recognition. Power plug can be customised. Please indicate which type of plug you need, EU plug or Flat plug or others. The off-delay time of relay can be set through config.txt file(0s~99s). Environment: indoor use only, the relative humidity is less than 95%. Note: 1. USB interface: can insert USB flash drive, copy voice files from USB flash drive to internal FLASH memory; cannot use USB cable to directly connect to computer to download voice files. 2. Trigger is external input, can have an external sensor input, low effective; COM and NC are external equipment control port, will close when body induction triggers to play. The installation is ceiling type. There is installation fastener, very convenient. If suspended on wall, the installation height should be not more than 2 meters. b) Pay attention to the positive and negative, no random connection. c) The load can not exceed the rated power. d) Do not install in the place with temperature over 40 degrees and large air flow or great temperature variation. Kingsound V1 and V2 have the same price. ​​If you need , please click to place order. When you place order, please tell us which kind of power plug you need. 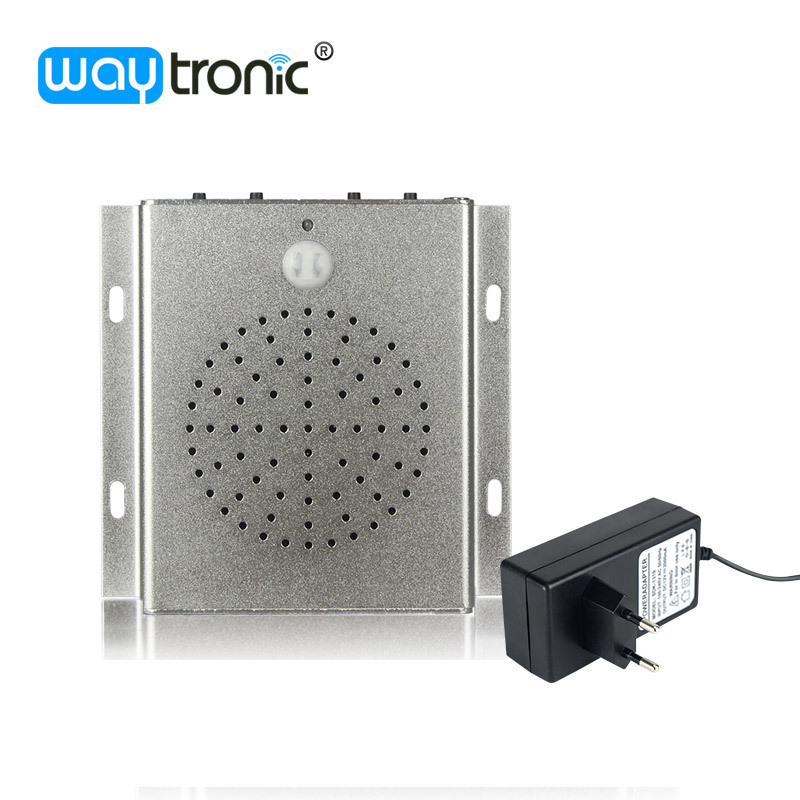 Shenzhen Waytronic Electronics Co., Ltd is an original manufacture with independent R&D capability specializing in voice electronic products and security products. In our store, we have 4 types of main products. 1. Voice prompting device, including infrared doorbell, infrared sensor sound player, etc. 2. Call recorders for iPhone and Android mobile phone. 4. Security products, including speed limiter, overspeed alarm, reversing radar, alarm light, alarm horn, sound and light device, forklift safety management system. If you have some special function requirements, please don’t hesitate to tell us. We can customize for you. Your needs is our pursuit, your satisfaction is our mission! Welcome your inquires about our products. In order to ensure you receive your order tax free or a lower tax upon import, we will declare a lower value. This lower price does not reflect the total price you paid or the market value of the product and may not apply to countries with different tariff rules. Any import charges/taxes or fees are the buyer’s responsibility.